The meeting will be held in Italian with English simultaneous translation. Full stay means accommodation (in double or triple room) and meals from Thursday night (dinner is not included) to Sunday lunchtime (lunch is included). For organizational reasons, the lunch on Saturday is not included in the full stay cost. The registration fee and the full stay cost will be paid cash at the beginning of the conference. There is an extra cost of €30 for accommodation in single room. In case of a shorter stay, it is necessary to indicate arrival and departure dates and times in the registration form. Any discounts will be notified by email. Please, specify in the registration form if you need only some meals. The corresponding stay cost will be notified by email. To register, https://goo.gl/forms/r0zYo49GXd8tzveG2. The registration deadline is April 15, 2018. The conference will be held in Rome, nearby Monte Sacro. 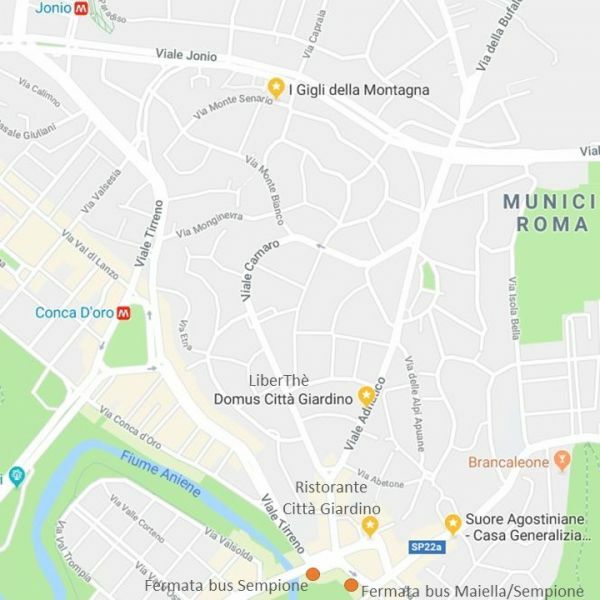 On Thursday evening, the conference registration desk will be at “LiberThè Domus Città Giardino” (Viale Adriatico, 20). On Friday and Sunday, the conference sessions will be in the lecture hall of “I Gigli della Montagna” (Via Monte Senario, 81). The registration desk will be in this place also. On Saturday, the conference sessions will be at Villa Borghese. Lunches and dinners will be served at Ristorante Città Giardino (Via Nomentana, 444 - Piazza Sempione). All these places are within 20 minutes walking distance. - Metro B (direzione Jonio), get off at station Conca D’Oro, then walk for 11 minutes. bus stop Maiella/Sempione, then walk for 5 minutes. - Metro line B (direction Jonio) get off at station Jonio, then walk for 7 minutes. - Metro line B (direction Laurentina), get off at station Bologna and continue on Metro line B (direction Jonio) to station Jonio, then walk for 7 minutes.